Global stock markets were under pressure for a second day on Friday, amid fears US mortgage market problems would prompt a worldwide credit crunch. 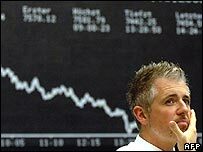 Billions of dollars, pounds and euros were wiped off share values, hitting businesses and individual investors. New York's main Dow Jones share index ended 31.14 points, 0.2%, lower at 13,239.59. The S&P made up some losses to close little changed at 1,453.64. London's FTSE 100 index had its worst day in more than four years, down 3.7%. In France, the main Paris-based Cac 40 index fell 3.1%, and Germany's Dax 30 index lost 1.4%. Earlier, markets in Asia had also closed significantly lower. Analysts say the crisis could make it harder for banks, firms and consumers to get access to loans and cash. If this persists, it could lead to a global recession. "Market participants don't know whether to buy on the rumour and sell on the news, do the opposite, do both, or do nothing, depending on which way the wind is blowing," investment bank State Street Global Markets said. UK Prime Minister Gordon Brown looked to reassure investors. "There will always be issues with the markets, and of course we cannot insulate ourselves from events that are happening in all parts of the world," he said. "I think the important message to be sent is we have done everything in our power to maintain the stability of the British economy." Global stock markets have been rattled by worries over financial institutions' exposure to bad credit in the US sub-prime mortgage market. Sub-prime lenders offer loans to consumers with a poor credit history. As a result of these problems, banks have suddenly started charging significantly more for the money they lend to each other, signalling that they are looking to limit their risks. For their part, central banks around the world have moved to prop up markets by lending money to banks who might be in trouble. The European Central Bank injected cash into the money market for a second day, as did other central banks worldwide. The ECB said its move was to "assure orderly conditions in the euro money markets". It injected 61.05bn euros (£41.65bn; $84.2bn) into the eurozone money markets on Friday. The US Federal Reserve intervened twice during the day, adding $38bn to the banking system, the largest amount since it intervened in the days following the attacks on New York and Washington on 11 September, 2001. Japan's central bank had earlier pumped one trillion yen ($8.5bn; £4.2bn) into the financial system to boost liquidity. The jitters come a day after the FTSE closed down nearly 2%, and following a fall of close to 3% on the Dow Jones index in New York. 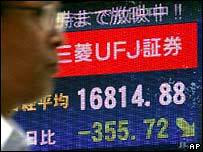 At close of trade in Japan, the Nikkei share index was down 2.4%, at 16,764.1. In Hong Kong, the Hang Seng index ended the day down 2.88% at 21,799.96, after trade was suspended early because of a tropical cyclone warning. South Korea's central bank said it would also intervene if necessary in financial markets to counter the international turmoil. The Reserve Bank of Australia on Friday added more than twice the usual amount of money into the banking system, injecting A$4.95bn ($4.19bn; £2.08bn) in its regular morning money market operation. Central banks in Malaysia, Indonesia and the Philippines intervened to sell dollars to support their currencies. BNP Paribas announced on Thursday that it was suspending three investment funds worth 2bn euros because of problems with the US sub-prime mortgage sector. In recent months, the number of loan defaults has increased because of higher interest rates, raising concerns that the wobble in the housing market will affect other parts of the economy and then start hurting other nations. The worry is that should banks make losses, it would hurt their earnings and their profitability, making them less willing to fund the takeovers and buyouts that have underpinned much of the stock markets' recent gains. Financial stocks led declines on Friday, with US mortgage lender Countrywide pacing the drop. Citigroup, the biggest US bank, Dutch lender ABN Amro, Royal Bank of Scotland and UK lender Barclays also slid.